At Lucent Family Eye Care, we can offer same day eye wear in certain cases, meaning that you can have your glasses ready in less than an hour. 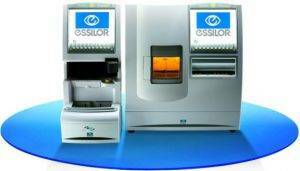 We have an in house Essilor Kappa edging system that allows us to do so. Having an in house edging system means that you don’t have to be without your glasses for a week or two while your new prescription is being changed! You will only need to drop off your frame at our office for 30mins to an hour. Why not enjoy a cup of tea or espresso at our office while you’re waiting for your glasses?